Here in Taiwan I wake up early every morning to write. 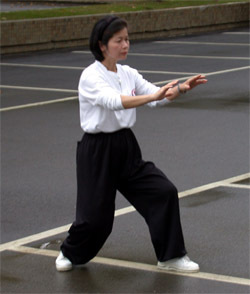 Afterwards I go out to the park to do tai chi and kung fu. On days when the writing ends sooner, I make it out in time to catch people dispersing from groups that have apparently been doing tai chi and other exercises. I always wished I could get out very early some morning with the camera and explore what's going on. And so on one morning when the writing didn't seem like it was going to happen, I snatched up the camera and headed quickly outside. In a parking lot just down the street I came upon a large group doing tai chi in unison. I readied the camera for what was to be a picture of ordinary people here in Taiwan trying to develop. I circled around the group's periphery snapping photos from different angles. What had been an undifferentiated mass slowly resolved itself into individual people. By the way each moved I could see who they were. One woman over at the edge stood out clearly from the rest. There was real beauty and peace in the way her body flowed. She relaxed with supernatural grace into each successive stance and proceeded from one to the next with confidence and poise. Her posture was exemplary but she remained soft throughout, so that she didn't impede the force coursing through her. Her face shone peaceful, yet alert and alive in a subterranean way ' like a meditating master. I quickly saw that the others were following her moves. She was the teacher. They were her students. My camera was reluctantly captured by the woman and the picture I'd set out to get of this group reinvented itself. No longer was it about common people trying ' that was proving such a difficult shot to get ' but about the rare one who didn't have to try. That was a much easier picture to take. I only had to point the camera in the woman's direction. To do things in an easy way was the quality of this amazing woman. Every move she made was effortless. She never lost her repose. An easy power coursed from the soles of her feet to the tips of her fingers and imbued every gesture with focus and definition. I snapped a few photos but quickly despaired of catching these qualities with the camera. Besides, I didn't want to play the crass, intrusive foreigner with a camera and disturb so marvellous a display. So I drew away and walked on. I came across a succession of other tai chi groups, one after another. When I returned home I put all the pictures I'd taken on the computer and showed them to my Taiwanese wife so she could see how many tai chi groups there were in our neighbourhood. She sat beside me silently as I flipped through the pictures until I came to this one. 'That woman has it,' she said with deep reverence. Even from my blurry photo, she could tell. For years and years that story stayed in my mind. I marvelled that anyone could see such a thing. Never once did it occur to me that it might be easy, that it might happen of its own accord and jump to the eye. We practice, whether it's morning writing or tai chi ' or even just sweeping the floor and washing the dishes ' not so much to master the difficult as to find the easy. And when we do find it, we ourselves feel it, and so does everyone all around. These are things that everybody knows to see, only most don't know that they know.